Here at Clean Air Act, Inc., we specialize in solutions to improve the air quality in your home. That's why we provide our customers with a state-of-the-art air cleaning device - the Breathe EZ Air Cleaner. 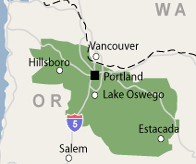 Our indoor air quality services are available in Lake Oswego, Woodburn, West Linn, Tualatin, Clackamas and throughout Oregon. Call us or get an online estimate to install our indoor air cleaner in your home today!